(HARLINGEN) – Texas State Technical College Registered Nursing student Michael Ortiz swapped his nursing tools for gardening tools during National Make a Difference Day, an annual community service event which is held the fourth Saturday in October. On this day, thousands across the United States volunteer in their local communities and TSTC is no different. Ortiz was one of more than 100 student leaders who gathered to plant more than 200 trees along the expressway at the corner of Lincoln Ave. and Frontage Rd. in Harlingen. TSTC Student Life Coordinator Belinda Palomino said students at TSTC have participated in National Make a Difference Day for more than a decade and she is proud to see that every year the anticipation and participation for the event continues to increase. In addition to giving back to their communities, Palomino said doing community service teaches students teamwork, team building, adaptability, critical thinking and problem solving. “By participating in National Make a Difference Day and other community service projects throughout the year, they get to learn soft skills, professional skills, they may otherwise not learn in a classroom,” she said. Which is also why TSTC Director of Student Services Griselda Sanchez and Human Resources Senior Specialist Lupe Deloera from TSTC in Sweetwater decided to travel seven hours south for National Make a Difference Day with their Student Government Association officers Javier Rocha, vice president; Joshlyn Tovar, secretary; Elizabeth Guevara, treasurer; and Brett Paniagua, senator. 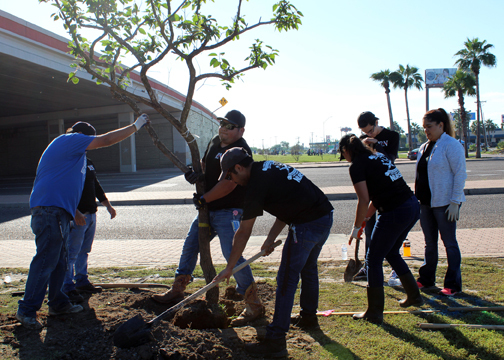 Although the students will do a similar community service project in Sweetwater and will work to beautify the TSTC campus with plants and flowers, they wanted to experience the large-scale event hosted by TSTC in Harlingen. Palomino said the success of this year’s event is credited to the partnership and help from Keep Harlingen Beautiful and the City of Harlingen. Executive Director of Keep Harlingen Beautiful Melissa Boykin said she is amazed at the number of volunteers that participated in National Make a Difference Day. For Harlingen and TSTC, National Make a Difference Day allows them to get one step close to completing the beautification process along the entire expressway in Harlingen. It will take several more years to finish. TSTC’s volunteer hours during National Make a Difference Day were valued at $14,814, a hefty cost savings for the city.